As a family run company we are committed to a customer-focused approach to business where trust, transparency and fairness are paramount, and this applies to all our finance deals. The long-term relationship we enjoy with our customers is testament to the quality of the customer experience they receive, the Carbase Cars they buy and the value of the finance we are able to provide. Do you like changing your car regularly but don't want to pay high monthly fees? A Personal Contract Purchase may be the right car finance option for you. With a range of low cost rates available we can tailor your car finance to your needs ensuring you don't pay too much for your new used car. Our sales team will help you identify how much you can afford and help you find the car that suits your needs. Our responsible and tailored used car service ensures you get the right car and a price you can afford. What is Personal Contract Purchase Finance? Personal Contract Payment (PCP) is a finance product that reduces the monthly payments by delaying part of the repayment until the end of the deal. It offers a wide range of flexibility with monthly payments, annual mileage and deposit all adjustable to meet your needs. You can also settle your agreement at any time. All these factors play a part in how much you pay back each month. PCP is a very flexible method of payment. As with Hire Purchase, the more you put down as a deposit, the less you will pay back each month, however with PCP a low annual mileage can also mean that you pay less per month. An accurate mileage prediction is important for PCP as it affects the residual value of the car so it is important to give clear and accurate information to your Business Manager as penalties can apply if you exceed your stated mileage. Can I finish PCP early (pay off or cancel)? At Carbase, if you choose to finish your finance deal early, whether that's due to a change in circumstances or wanting to buy the car, you can return the car for a valuation. This valuation will calculate a settlement figure, which is the amount that you are required to pay to close the finance deal, and we can also offer you the option to purchase the car. Once you have the valuation settlement figure, you will then have two options: you can pay the settlement and keep the car, or you can sell the car. Unlike a personal loan or Hire Purchase (HP), you can get behind the wheel of a new used car for lower monthly repayment costs. It'll also let you fit the monthly payments to suit your budget, so you could buy or borrow a more expensive car than you might not have been able to afford outright. Since PCP finance deals are only offered on new or nearly-new cars, it's less likely that you'll need to fork out for repairs, so you'll be able to fit it into your finances more easily. Also, since the cars have a minimum sum's worth at the end of your contract, you won't need to worry about the future trade-in or resale value of it. 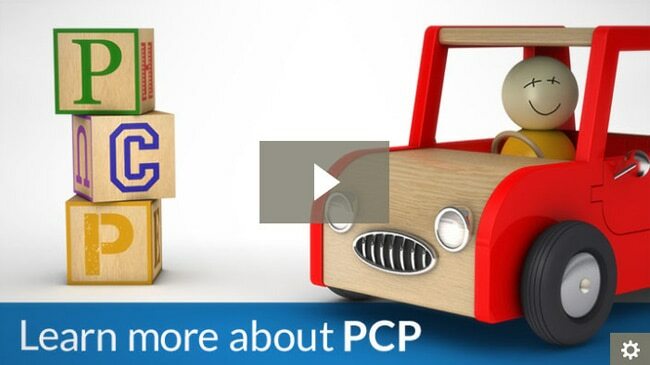 Finally, a PCP deal is flexible - you'll have several options at the end of your contract, meaning you'll be able to decide whether you want to buy the car or not. As with other car finance deals, you won't own the car during the period of time before your contract ends. You also won't automatically own it when the contract finishes - you'll have to pay a balloon payment to own the car beyond your contract. If the predicted balloon payment - the minimum future value of the car - is very close to the actual value of the car when you reach the end of your contract, you will have very little money to roll over to use for the deposit on another car, if you choose not to buy the car you currently have and instead trade it in for a new vehicle. If there isn't any difference, you'll have to come up with the finance for another deposit if you want to start a new PCP finance deal. There are a few charges that you could face when you hand the car back or trade it in. At the beginning of your finance deal, you will be asked to specify how far you'll drive the car each year. If you go over the agreed limit, you can be charged between 7p-10p for each mile you are over - it's important to carefully check your finance agreement for the exact figure. The future value is also dependent on keeping the car in good condition, so you'll be charged extra to put right anything that's not simply wear and tear damage. If you're not sure whether PCP finance is the right finance option for you, why not consider Hire Purchase finance? Read more about HP finance here . How does my credit history affect the interest rate on my finance plan? If you're wondering whether you'd be able to take out a PCP finance plan due to your credit score, we can assist you. You can compare finance deals from a panel of lenders with your credit rating, from excellent to bad credit, by using our Free Car Finance Check. This will use a quotation search to show your likelihood of acceptance for a finance plan without affecting your credit rating. Since Carbase is a credit broker, and not a lender authorised and regulated by the Financial conduct authority, our interest rates are fixed for the terms of our agreements and are determined subject to status by your credit score. PCP deals from Carbase are available from 6.9% representative APR.